I saw so many cool accessories and summer color blocking items from my post 2 days ago I knew I wanted to expand some more on this. Takes color blocking to a whole other level. That pink and teal is out of control... reminds of "There's Something About Mary" for some reason. Someone far more fashionable than I would have to pull that one off in the boudoir. Maybe Elle Woods? 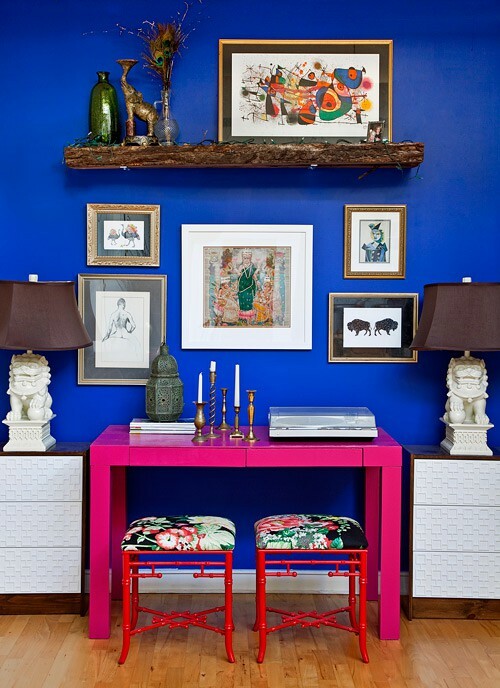 I do love that electric blue with the pops of color and teal in the living room. I.just love white furniture in any room with color.